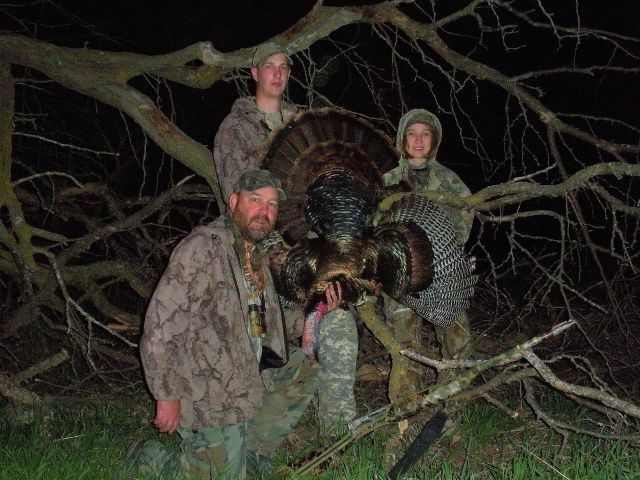 I mentioned earlier that my kids and I usually do more scouting for spring turkey season than we do actual hunting with weapons in our hands and turkey dinners on our hearts. So, you might say we have done very little hunting this spring when actually the hunt started weeks ago and culminated in one nice Tom coming home with us on Monday night. Besides the fact that I just love to watch and listen to turkeys we get a real good idea where the birds are, what birds are there, and what they are doing. We hunted one of those spots Saturday evening and could not quite close the deal, but we knew we were in the right spot! So Monday night my son, Daniel, and I took my daughter Emily out with us. We did not see turkeys as soon as we had Saturday evening, but eventually we ended up with several toms and some hens behind us and one tom and some hens in front of us. We only had about 40 more minutes to hunt and since all the toms were with hens I figured I might as well put on a calling exhibition and see what happened. So I did my best impression of a turkey calling contest and got the toms all gobbling at me. Daniel says the ones behind us were coming our way; then he says two of them were really coming! I turned around and here comes a jake and one mature tom right down the hill–better hurry and get ready to shoot! We spent some time clearing brush behind us before we sat down so this time we were ready for them to come in behind us. I thought they would swing on Daniel’s side, but no, right over on my side. I let the jake walk up on the terrace behind us and then when the big tom walked up there I rolled him, 25 yards. 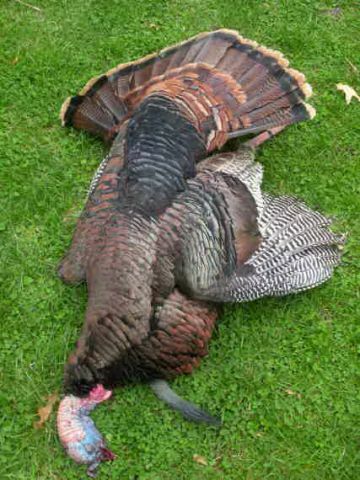 The ole 16-gauge spoke, and another turkey went down (every turkey I have ever killed has been taken with that gun). We stayed put after the shot and tried to get those other toms to come down to “kick him while he was down”, but they were having none of that; all they would do is stand up there and gobble at me (they gobbled when I shot!). So we only got one last night, 22 pounds, 3/4-inch spurs, 9-inch beard, a good-looking, “Eastern-looking” bird, 2 years old. Much more spring to come! Stay tuned! It was dark by the time we snuck around all the turkeys and got back to the pickup. 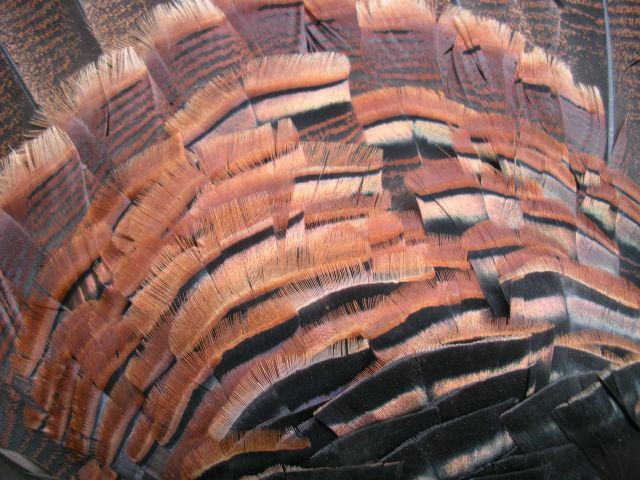 I still marvel at the beauty of wild turkeys; I love every one of them. Oh, and they taste good too!